My family and friends have always made fun of me because, in their words, "You won't do anything until your brother does it first." For proof, see: boot cut jeans, Sigur Ros, shoulder strap backpacks, being born. To an extent, they're right. I am notoriously hard-headed and set in my ways. If something isn't an immediate upgrade (and sometimes, even when it is but if I'm in a particularly ornery mood), I shun suggestions in favor of the status quo. Before Michigan's season opener against Western Michigan, Al Borges said that the first play from scrimmage would probably be a power run. It was a carry by Denard Robinson. Against lowly Eastern Michigan, Denard ran the ball 26 times, despite the coaching staff's insistence that he carry the ball less this year. 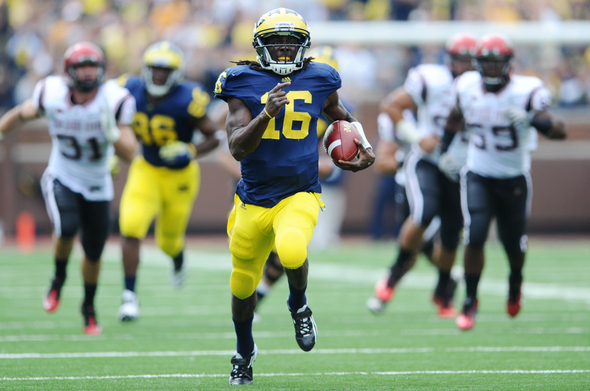 Against San Diego State, Denard carried the ball 21 times. What was clear to everyone else prior to the season is now clear to Borges: Denard Robinson is an immediate and noticeable upgrade over any other option on the Michigan offense. The use of Denard in the running game is necessitated, however, by his total inability to throw in this system. Whether its early-season jitters, a lack of confidence in his reads, or a clearer display of the inaccuracy he showed last year, through four games, Denard's struggles in Borges passing system are no fluke. Robinson followed up a 7/18, 2 TD, 1 INT game against EMU with a 8/17, 93 yard, 2 INT game against a San Diego State defense that was 72nd in defensive pass efficiency heading into Saturday's matchup. But as the score indicated, all was not gloomy in Ann Arbor. The defense was able to stuff an offense that had averaged 38 points per game (albeit against mediocre competition). They held SDSU star back Ronnie Hillman nominally in check (5.2 YPC on 21 carries; he was averaging 6.5 YPC coming into Saturday's matchup). And uninspiring senior Ryan Lindley completed less than half of his passes for a pedestrian 5.3 YPA. He was plagued by drops, but for the most part, Michigan covered well, got pressure, and once again looked like a competent defense, which for the next 3 years will be the greatest compliment levied toward this unit. Blake Countess can cover. After Troy Woolfolk got injured for the 27th time this season, Countess came into the game over Courtney Avery who struggled in pass coverage. San Diego State tested Countess by throwing at him as much as possible. For the most part, he held up and showed not only good coverage skills but solid tackling fundamentals. I would not be surprised if Countess rockets up the depth chart and even finds himself in the starting rotation soon. For the second week in a row, Michigan didn't bring many blitzes. Greg Mattison either felt the team was performing well in their base defense or didn't want to show new blitz packages, but what was a heavy blitzing defense in the first two games has been relatively subdued in the last two games, especially once the score was no longer in doubt. Vincent Smith had his two best runs of his Michigan career in this game. On the one, he sneaked through a hole in the offensive line that didn't exist and ran for 32 yards. The second was his scatbacking for a touchdown late in the fourth quarter. This is the performance that excited Michigan fans during Smith's freshman year. Stephen Hopkins has officially fumbled his way out of the running back rotation. He should get little to no carries for the rest of the year because doesn't give the team anything they can't get anywhere else and isn't reliable enough holding onto the football. Am I the only one that's worried about the coaching staff calling Denard's number on every third and short? If the idea is to keep Denard healthy, always running him between the tackles on third and short is the best way to get him injured. He's running directly into swarms of linebackers that are taking shots at him. Eventually, this will take Denard out of a game. I'll have to rewatch the game, but Will Campbell appeared to have a decent game. Caveats about the size of SDSU's offensive line aside, any progress from Campbell is a positive. Brendan Gibbons, to no one's surprise, missed another field goal. That Matt Wile didn't attempt that kick is discouraging, though I expect the coaches will give him a shot in the coming games. Gibbons is simply not a functional field goal kicker. On Saturday, the atrocious Minnesota Gophers, who are 1-3 with losses to North Dakota State and New Mexico State, come to Ann Arbor. This is the lockiest lock of the Big Ten season. Michigan should trounce these guys. I think Gibbons is 1/2 so far this year and that missed one was a 40 yard attempt last Sat. I understand why you feel the way you do after last year but I think you should probably get a larger sample size before making that claim. At least Gibbons missed "better" than last year. That attempt was close, and he did make his first shot. That being said, it's pretty obvious Wile needs to be given a chance.